Find out what our experts have to say about Hero Super Splendor! The least priced variant is Hero Super Splendor SDA priced at Rs. 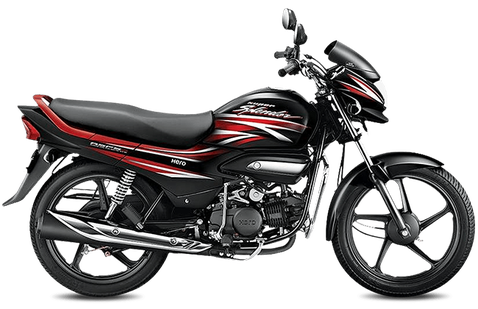 69,804 and the most priced variant is Hero Super Splendor SDA SX priced at Rs. 70,502. Choose the Hero Super Splendor which fits the bill of you. Hero Super Splendor is a 125cc motorcycle that was first launched in india in the year 2005. All thanks to a balanced design and some useful features, the Super Splendor is still delivering decent sales to the company even after a decade of its inception. The bike was last updated in December 2017 and the new model received some tweaks in design along with the inclusion of i3s technology to offer better fuel efficiency. The 125cc engine on the new Hero Super Splendor is now completely in-house developed by the company that offers slightly better power and torque than the older model. The motorcycle gets some interesting features like side stand indicator, all black theme with attractive graphics, an easy electric start and more. Hero Super Splendor 125 is currently on sale in India at a price of Rs 57,200. The company sells the new Super Splendor 125 alongside the older model that can be yours at a slightly higher price tag of Rs 57,950. Both prices being ex-showroom, Delhi. The bike primarily challenges the likes of Honda CB Shine, Bajaj Discover 125 and the Yamaha Saluto in the segment. Both the old and the new model of the Hero Super Splendor are on sale in five colour shades including some appealing dual tone colour options. Hero Super Splendor has a quite mature design that presents a perfect balance between simplicity and appeal. The front end of the motorcycle gets a curvy headlamp that gets a black coloured visor. The all-black theme makes the bike look sporty and is a plus point in terms of aesthetics. The Super Splendor gets attractive graphics that enhance the visuals and steps up the desirability. The tail lamp on the new model has been given a makeover due to which it looks more appealing and stylish than before. The instrument cluster on the bike is a three-pod unit that houses a side stand indicator as well. The motorcycle gets a long and comfortable seat that offers a decent level of comfort to both rider and pillion during commutes. Overall, the bike looks proportionate and appeals to office goers and youngsters as well. Hero Super Splendor gets power from a 124.7cc, air-cooled engine mated to a four-speed gearbox. The carbureted engine is good for producing 9PS of power along with 10.35Nm of torque in the old version. On the other hand, the new model of the Hero Super Splendor has slightly better power and torque figures at 11.3PS and 11Nm respectively. The motorcycle gets i3s technology that aims at a better fuel efficiency. All thanks to this, the engine shuts down automatically when in idle and the gearbox is in neutral for five seconds. The engine starts again as soon as the rider presses the clutch. The motorcycle can touch a top speed of close to 90kmph and the overall fuel efficiency is around 65kmpl in real life riding conditions. Braking on the Hero Super Splendor 125 is taken care of with the help of 130mm drum brakes at both ends. The company does not offer a disc brake with the bike even as an option. The Super Splendor gets conventional telescopic forks up front along with twin spring shock absorbers at the rear. Hero Super Splendor rides on stylish black alloy wheels which come shod with 2.75x18 - 42 P/4PR front and 2.75x18 - 48P/6PR rear tyre. The Super Splendor is easy to manoeuvre even in tight city traffic and hence, ensures hassle-free commutes. Built on a tubular double cradle frame, the motorcycle feels stable even at high speeds and feels confident around corners too. Hero Super Splendor gets 130mm drum brakes at both ends that offer a decent stopping power. The bike also features AHO (Automatic Headlamp ON) due to which the headlight always stays ON, thereby enhancing the visibility of the bike that results in lesser chances of a mishap. Another feature that adds to the safety is the side stand indicator. The red coloured indicator glows up when the side stand is put down that alerts the rider and prevents any mishap. The 35W halogen headlamp on the Hero Super Splendor offers ample illumination in the dark and hence, ensures stress-free commutes during nights.